Excellent reputation, we are proud to be highly recommended on Which? Trusted Trader website by our clients. Bhakta Builders Ltd carried out maintenance work on our bathroom after the previous builder botched the work up and we sacked him. Vladimir did an excellent job and we now have a brand new bathroom which we are so proud off. In addition to our bathroom we also used Bhakta Buiders Ltd to carry out external renovation and decorating on the front, side and back of the house and the work carried by George, Richard and Peter were of the highest standard and the end result was of top quality. As landlords or house owners we always want to get the best price (quote) for the work to be carried out on our properties and after seeing the end result of this team's workmanship, I can now vouch that their quote is reasonable for the quality of work you will be getting. We will be using Bhakta Builders Ltd to carry out further work on our home starting with our stairway, and the inspection of electricity and wiring to install a new circuit board. Once again many thanks to George, Vladimir, Richard and Peter. Top professionals, friendly and best communication I have known from a trader. We had our kitchen partially refurbished: new work tops installed; oven, hob and dishwasher installed; old sink removed; new sink installed in a new location; walls tiled; small kitchen units installed. Our experience with Bhakta Builders was excellent from start to finish. George, the boss, kept all his appointments and his communication was excellent. The work was carried out by Vladimir and we couldn't have been happier with him: his workmanship was first class; he was thoughtful and considered and tackled some tricky tasks with great skill and smart thinking; he was friendly, personable, punctual and totally professional. As is often the way, some unexpected challenges came up during the work but Vladimir found a way round them and there were no extra charges at the end of the job - the price quoted was the price we paid. The kitchen looks great now it's finished. George has been in touch several times since the work was done to make sure we were happy and to check on some teething problems we have had (not the fault of Bhakta Builders). Bhakta Builders' quote for this job was not the cheapest nor the most expensive we got but we decided we would pay a bit extra in the hope that we would get a very professional job - that's exactly what we got and we feel the price was justified. We had all our wires tested, our fuse box changed, sockets replaced and our bathroom light changed in our flat. Steve was an extremely competent and efficient electrician which was a relief after a previous experience of an electrician bailing on us. He was also very patient and good at explaining all the details of the work being done to someone who knows nothing about electricals. George was also a pleasure to talk to and was very transparent about the prices which I appreciate. If I need any future work done I will definitely be contacting them. I cannot recommend them enough! I engaged Bhakta Builders for the first time, and cannot praise them highly enough. George's first visit was so thorough that he instantly stood out from all the other companies, and everything such as issues and timing was discussed and explained. Work was booked in surprisingly quickly and the workmen were real professionals whose meticulous work is fantastic. They were also pleasant, helpful and considerate to have around and meticulous in clearing and cleaning, both before and after. George liaised constantly with me on progress and any minor queries or changes. I have had many building projects over the years and used a number of companies but I can unhesitatingly say that I trust this company completely to execute a job to the highest standards and make the experience as easy as possible. I will never now go elsewhere and wholeheartedly recommend Bhakta Builders. 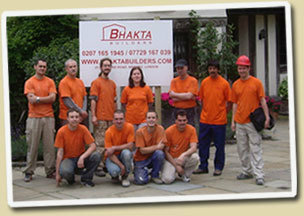 We had building and electrics works completed by Bhakta Builders, who were recommended previously by a friend. We needed a partition wall built, with a door frame and light switch moved. The wall was plastered and painted too. We also had electrics repaired and certified, including a replacement bathroom light, some fixtures moved. They replied to my questions immediately and kept me informed at every stage, which I really appreciated. The pricing is transparent and competitive. They are tidy and considerate. I would recommend Bhakta Buikders to anyone. Steve was very friendly and extremely professional. He ascertained the problem immediately and sorted it out with no fuss at all, sticking to his initial estimate of cost. A great service. Thank you. Overall we think they did a very professional job, with everything finished to a very high standard. George is a perfectionist! He really wants the very best finish. I can live with imperfections in a flat like this - but he doesn't like to leave anything looking less than perfect. He and his team were polite and friendly, and very hardworking. Also - and this is important for us - they were clean and tidy. This was a really dirty job but they took great care to cover everything to limit the horrible black plaster dust getting in, and they did a great clean up job afterwards. They were so tidy, even the rubbish bags they put downstairs until they were collected were neatly stacked. And they are trustworthy. We were happy to leave George and his team to do this work while we were overseas. From decorating works, shed building to re-fitting a bathroom, Bhakta Builders have done great work for us. Always punctual, efficient, neat and courteous, they are a pleasure to do business with. Very reasonable quotes and very knowledgeable. I'd highly recommend them for your building and re-decorating work. Kitchen installation. We were let down by B&Q installation service very late in the day. George from Bhatka Builders came out that evening to discuss the job and give us a quote. He was able to start the job within two weeks, fitting the start around other jobs. He dropped in most days to check progress and the inevitable snags were dealt with quickly and efficiently. The whole experience has been a pleasure: a very thorough job, lots of attention to detail, his workmen polite, conscientious and cleaning up each night. Also worked long days over one of the hottest spells of the year! The price was very reasonable as well. I'd recommend this firm to anyone.